The Next Stage: Women and Retirement: In praise of New Year’s resolutions: I didn’t keep them, but I’m glad I made them. In praise of New Year’s resolutions: I didn’t keep them, but I’m glad I made them. Maybe it’s a silly gimmick, but as a retiree I need help keeping track of my time. It’s easy to let the days slip by without doing much of anything. The Italians have a phrase for this-—dolce far niente, sweet doing nothing. Less urgent than the book project, but high on my list, is really learning Spanish. I resolved to spend at least 2 hours a day on my book and 30 minutes reading books/articles in Spanish. The biggest failure was exercise. I had resolved to swim or walk briskly for 30 minutes at least 3 times a week. This averages 12.8 minutes per day of aerobic exercise. I managed a pathetic 3.5 minutes a day. For people in their 60’s, it’s “use it or lose it” time with our brains and our bodies. Supposedly learning something new (like a language) is a great anti-Alzheimer’s strategy. So I guess I have that covered with Spanish. I put exercise on my list primarily for my husband. I get a whole lot of exercise in my daily life. I’m a fidgeter and a forgetful fidgeter who lives in a 3 story house, so I'm continually running up and down stairs. During the gardening season I get a lot of weight bearing exercise lugging 50 lb. bags of fertilizer. But my husband is nowhere near as active on a daily basis. I want him alive and well for a long time, so I’m trying to get him to exercise. Several years ago we joined a health club with a good laps pool. We hardly ever used it and vowed when we were retired we would swim 3 times a week. Well, it hasn’t worked out that way and keeping track of this really brought it home to me. I’m determined that we’ll do better. My final resolution was to spend at least 20 minutes a day on the kind of housework which is not done as part of my weekly routine: cleaning kitchen cabinets and junk-filled drawers, tackling a filthy basement and cluttered attic. I managed an average of 9.3 minutes a day—-better than the 3.5 minutes on aerobic exercise, but still pathetic. All this record keeping may seem a little silly, but I’m kind of getting into competing against myself and reaching my goals in February. 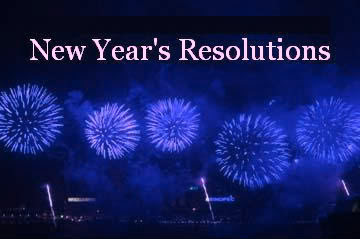 Anybody have any progress reports on their New Year’s resolutions? I think you should be proud of yourself, you are trying and succeeding in smaller ways then you had hoped but still succeeding. Just keeping it as a goal is a success. I think change happens in very small increments and then when you look back, if you keep the vision alive, you can see the success. Regarding my goals, exercise is firmly inbedded as a habit, now my goal of meditating every day is not. But I do keep vision alive and do not plan on losing it. Aw, I'm sorry you didn't keep them. There's always next year.